ON Sunday Deborah Douglas will be surrounded by more Mother’s Day cards than any other mum in the region. For she and her husband Craig have not one, two, three or four children . . . but a dozen. And Deborah thinks she may have the biggest 21st century brood in not just Dumfries and Galloway, but all of Scotland. The 37-year-old gave birth to her first child Ellie, now 15, in 2003. Then came Liam, 14; Troy, 11; Cora, also 11 but not twins; Eva, 10; Zac, nine; Indi, seven; Rio, six; Ezmae, four; Aria, two; Zuri, one; and the most recent addition is baby Eboni, who is five-and-a-half-months. 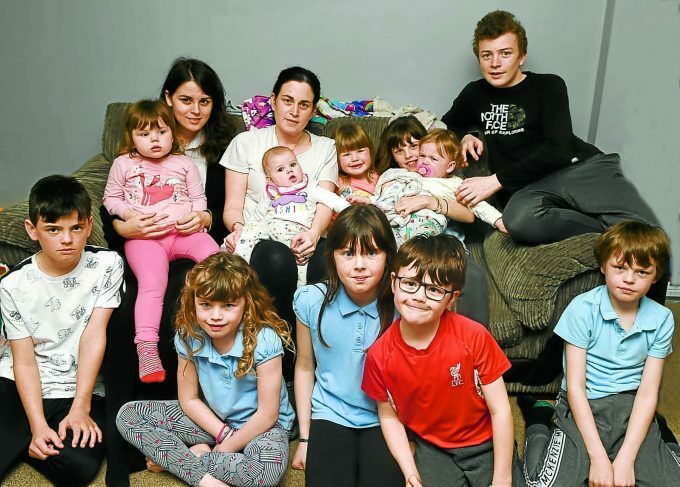 It means Deborah has spent a whopping total of nine years of her life pregnant with her 12 children – none of which are twins or multiple births. Discussing her big family, the Heathhall mum said: “I never would have dreamed of having 12 children when I was younger. And while 12 would seem challenging for some, Deborah says the secret is having a routine that works. She said: “We’re in a great routine. You could hear a pin drop in this house after 8.30 pm. “All my children slept through after just being a few weeks old and we’re really organised with bed times, the younger ones are in bed early and the older ones are quiet in their rooms with i-pads. “I go to bed at about 9.30 pm/10 pm and that’s me until 5.30 am/6am. Talking about the everyday logistics of being a mother to 12 children, Deborah said: “I do five loads of washing a day, more if bedding needs done or one of the kids is sick. “Three food shops a week, two Tesco and an Iceland delivery. We go through four pints of milk a day – not including Eboni’s baby milk and Zuri’s special milk. “Holiday wise we like to go to Southerness. The children have taken turns going abroad or elsewhere, but we’ve never tried to go abroad all at once. And with 12 birthdays to plan and buy for, she says birthdays can be manic too, especially as two of her children share the same birthday, but three years apart and one has a special Hogmanay birth date. Discussing the harder aspects of parenting a larger brood, Deborah said: “I can’t remember the last time I ate something while it was still warm and I don’t even bother making a cup of tea for myself, it would be cold by the time I get to it. And recently the Douglas family had an unwelcome guest in their house . . . in the form of chicken pox. part is some people can be quite nasty when they hear you have 12 children, but there’s always going to be judgmental people. Meanwhile, describing the joys of family life, she said: “Christmas is amazing, there are presents everywhere and the children are so happy.